You are here: Home / dinner / What do Mexican Kids Eat for Lunch? As you tuck into your packed lunch at school, have you ever wondered what children in other parts of the world eat for their lunch? Do they eat sandwiches in countries like Mexico? If not, what do Mexican kids eat for lunch? 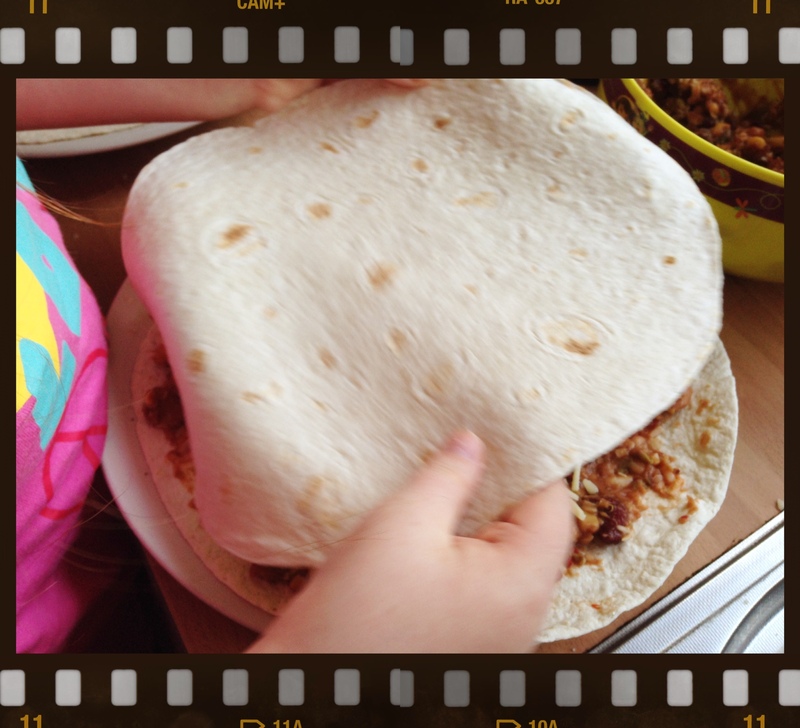 Let’s find out, and make a Mexican lunchtime favourite: quesadillas. In hot countries like Mexico, it’s typical for children to have a snack in the morning and then have a lunch at home when school is finished. School usually finishes at around 2-2.30 pm in the afternoon, and many businesses close at this time for a couple of hours–this is called a siesta. It’s the hottest time of the day in Mexico, and this gives everyone in the family the chance to rest and eat lunch together. So Mexican children don’t really have a packed lunch to take to school like you do. However, they do have a kind of sandwich, which is a popular thing to eat for comida (Mexican for ‘lunch’). It’s called a quesadilla, and we are going to learn how to make one. In Mexico, the type of bread that is eaten most often is a wrap, or a tortilla. Tortillas are made from either flour or corn and are round flat breads. A quesadilla is made by filling a tortilla with a cheesy bean mix and folding it in half, and then it is cut into wedges. Queso is Mexican for cheese, so a quesadilla is a kind of a cheese sandwich. You say quesadilla like this: kez-ah-dee-ya. 1. 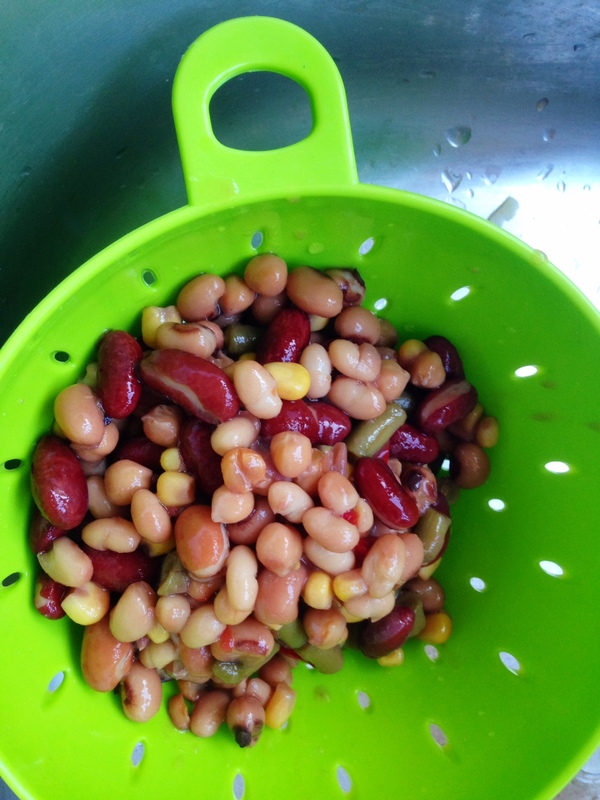 Drain your beans in a colander, and then mash them in a bowl. 2. Grate your cheese and add half of it to your mashed up beans. 3. Mix in your chipotle/barbecue sauce. 4. Spread your cheesy bean mix onto a tortilla. 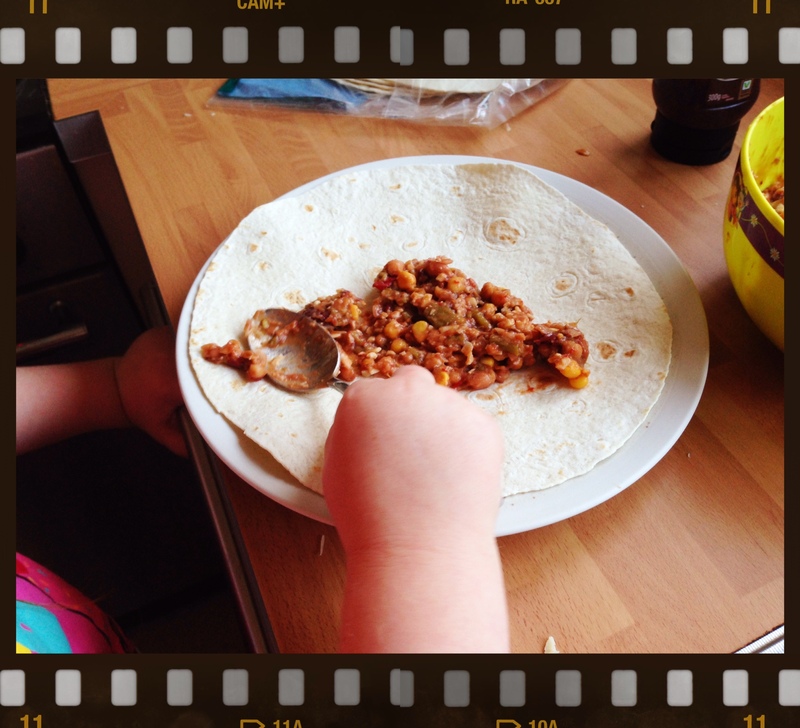 If you are using large wraps then sprinkle half of the cheese you have left over the bean mix. If you are using smaller wraps then sprinkle about 1/3 of your cheese over the mix. 5. Put another tortilla over the top and press down. Repeat the same process for the remaining tortillas and bean mix. 6. Get a grown-up to heat up a griddle pan or a frying pan–you don’t need any oil. What’s a Griddle Pan? Griddle pans put pretty marks onto the quesadillas but we just used a frying pan and they taste just as yummy. 7. While the pan is heating up, you can put a tortilla into the microwave for 40 seconds to start the cheese melting. 8. When the pan is hot enough, your grown-up should put a quesadilla into the pan and cook for 2 minutes. Flip over, and cook the other side for 2 minutes. You can now cut your quesadillas into wedges and eat! Provecho (that means ‘enjoy your meal’ in Mexican Spanish). 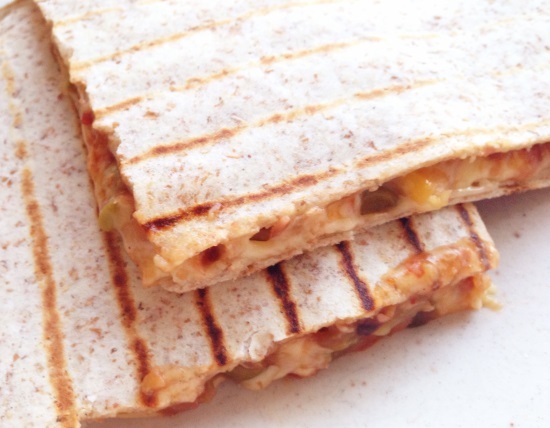 Quesadillas are just as yummy cold as they are hot. You can eat them with other things like wedges and salad for your dinner, or put them in your packed lunch box and eat them cold just as you would eat a cheese sandwich. Delicious! Do you prefer this to a cheese sandwich? Let us know what you thought. Image credit: With thanks to Adam Cohn for the making tortillas picture. This picture has been released under a creative commons license. I absolutely love this blog. 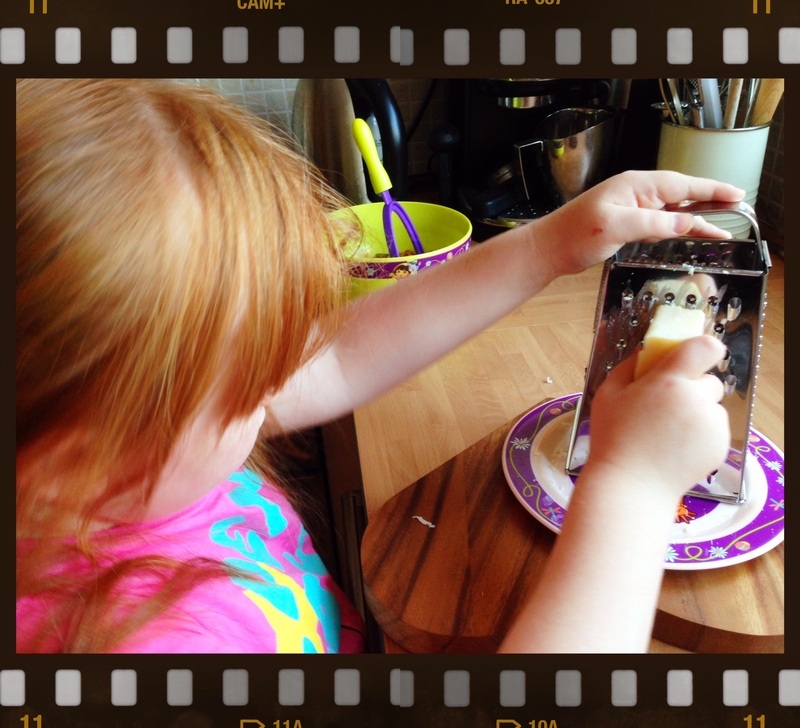 I love the learning that goes with each recipe. Brilliant. This is a great recipe that my children, husband and I thoroughly enjoy! Thank you for the lovely comments 🙂 The great thing about this recipe is that it’s so easy but tasty too. Glad you like it.